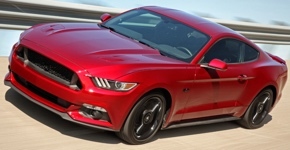 The 2016 Mustang GT comes with the 5.0 liter, V8 engine; 5.0 fender emblem; GT rear badge, fog lamps, and several other features including unique wheels and handling/performance options. The GT Premium adds the four Selectable Drive Mode switches, heated and cooled front seats, leather-trimmed seats, aluminum pedals, ambient lighting, audio upgrade, dual zone temperature control, illuminated door sill plates, satin aluminum dash panel, and much more. This is an amazing 2016 GT California Special Mustang in Deep Impact Blue exterior paint is owned by Jason Stedry of Allen, Texas. Jason says, "I purchased this 2016 Ford Mustang GT/CS fastback on April 2, 2016 and two days after the car rolled off the assembly line. I was looking for a Mustang that was unique and in limited production numbers when I found this GT/CS. The looks of the GT/CS grabbed my attention both for the exterior and interior. The California Special includes 19' Ebony Black-painted machined aluminum wheels with 255/40R19 tires; unique performance front air splitter; unique black grilles, and hood and side stripes; strut tower brace; black raised decklid spoiler, side-view mirrors and hood-vented air extractors; faux gas cap; unique dark tail-lamp bezels; leather-trimmed seats with Miko suede cloth inserts and red stitching; unique instrument panel finish and door-panel inserts; and premium carpeted front floor mats with embroidered logo." This Triple Yellow 2016 Mustang GT California Special is owned by Dave Richmond of Ohio. Standard features of the 2016 California Special include the hood cowl side stripes with matching low side stripes, 19 inch ebony black painted machined wheels, unique front air splitter. Dave's Mustang also has the Black Accent Package which includes the black rear spoiler, black over the top stripes, black painted 5.0 badges. Nice view of a 2016 Ingot Silver Mustang GT Premium with Black Accent Package. This package includes the 19 inch black-painted aluminum wheels, black-painted exterior badging, unique dark taillamp accents, and black raised blade-style rear decklid spoiler. Getting ready for the 2016 Mustang. There will be a California Special package for the GT and a Pony Package for the V6. Also the GT will have turn-signals in the hood similar to the 1968 louvered hood but it appears from the above photo they are in small recessed pods on the hood. Ford promotional photo set of an Oxford White 2016 Mustang GT California Special convertible. Visible exterior features of the California Special include hood and bodyside stripes, a unique front grille design with off-center tri-bar pony emblem, and black hood-recessed turn signal pods. There is also unique wheels, California Special decklid badge, inside dash badge, and badge in the engine compartment. This Magnetic gray 2016 Mustang GT has the GT performance package which includes the unique wheels, front air splitter, strut-tower brace, larger radiator, upsized rear sway bar, heavy-duty front springs, performance tuning, oil/vacuum gauge pack, and a lot more. Ford promotional photo of a right-hand drive, 2016, Ruby Red Mustang GT build in the Flat Rock Assembly Plant. As of this writing there are 75 countries or territories (35% of the population) with left-hand traffic which this right-handed drive Mustang is designed for. 161 countries or territories are like the USA which drive on the right.